I took a fresh look at trying to wrangle Tkx into working on the standard Perl distribution. Tkx is ActiveState's module that provides a modern, updated Tk framework for Perl. I previously wrote about how the old Tk module for Perl has been neglected for many years and is extremely outdated and has very little hope for being improved on. 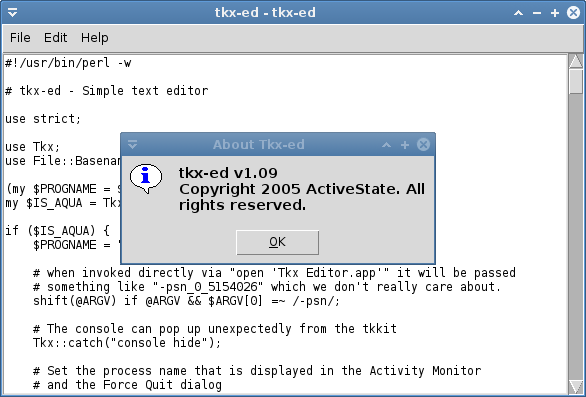 Tkx brings a more updated Tk interface to Perl. The only problem is, it only really runs well on ActivePerl, and not the stock version of Perl. I've been testing Tkx over the years on various versions of Fedora Linux and Perl, and every time I'd get the same results: segmentation faults. It was impossible to run any code that uses the Tkx module, because attempting to do so much as use Tkx; would cause a segfault. I chalked it up to "it only works with ActivePerl" and left it alone. But now I decided to give it another go. I was seeing the same symptoms this time as before. When trying to install it with cpan or cpanm, it would fail to install because its test suite was failing (giving errors like, can't find package tk). If I installed it while skipping the test suite, the tkx-ed example program would give segfaults when run. Just as before. I found out through tinkering with it that I needed to yum install tk (it makes sense; Tkx is a wrapper around Tcl/Tk for Perl, so you need "the" Tk installed for it to work). With this, running make test would have it run through the test suite and I'd see all the graphical Tk windows pop up and disappear. But running tkx-ed would still give segfaults. I believe I'd gotten to this point before. The test suite would work, but nothing else would. So I decided to try running the test suite "by hand", perl t/LabEntry.t. Segmentation fault. What? How can the test suite run all these scripts successfully but I can't run them myself? So, I dissected the Makefile that was used for the test suite. Shazam. This is tkx-ed running on a stock version of Perl 5.14.2 on Fedora 17. It seems that the PERL_DL_NONLAZY environment variable is required for the Tkx module to work. This is weird. I don't call this a victory though. Requiring this environment variable to be set for your Tkx app to run isn't very ideal. If you wrote and distributed a Tkx app for Linux users, you'd require the users to run a Bash shell script in order to launch your program instead of just running your Perl program directly like they'd expect. But, at least it works! Note: I also needed to yum install bwidget because tkx-ed would give a "can't find package BWidget" error without it). Thanks that was what I was searching for.